You are here: Home / Recipes / Lunchbox / Maple vanilla roasted chickpeas, only 4 ingredients! 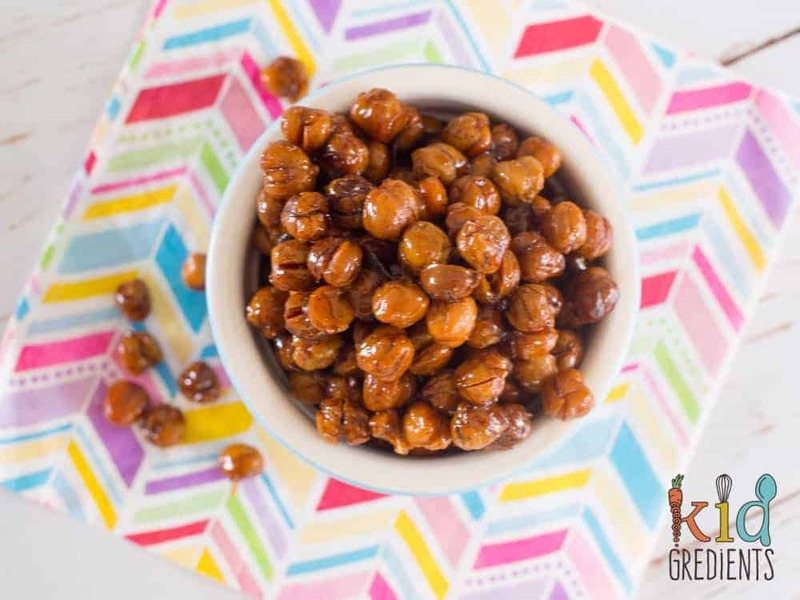 We love roasted chickpeas! And you know what? They are perfect for taking to school in lunchboxes! 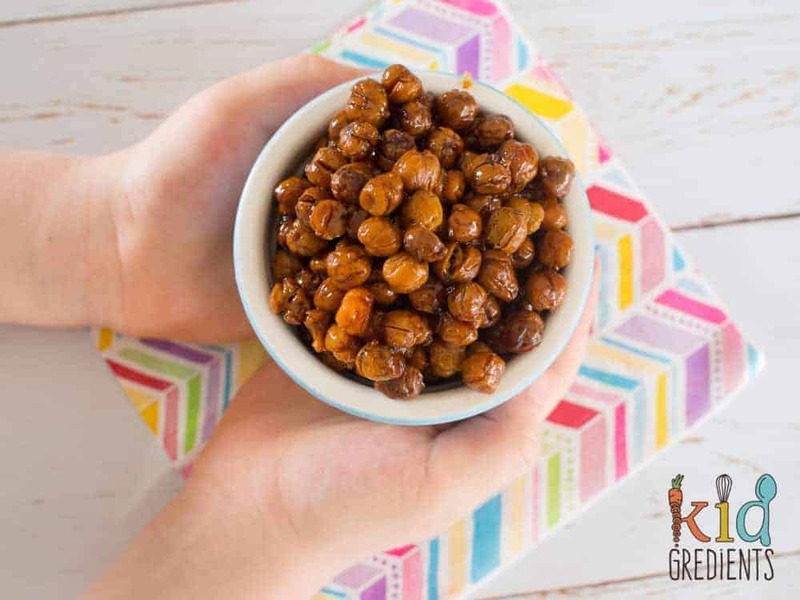 These maple vanilla roasted chickpeas are the bomb! You won’t believe that there are only 4 ingredients in them. These are perfect for kids who like a bit of crunch in their lunch! I’ve been doing school orientations. My little guy is off to school so I’ve been attending his sessions but I’ve also been talking about my lunchbox obsession at other schools. And people are so interested to know how to pack better lunches. 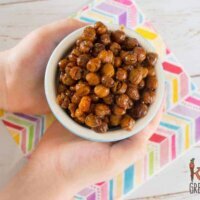 Chickpeas came up as a way to add extra protein and I thought I would share the recipe I’ve been using lately that makes them super yummy. easy to make and so crunchy! 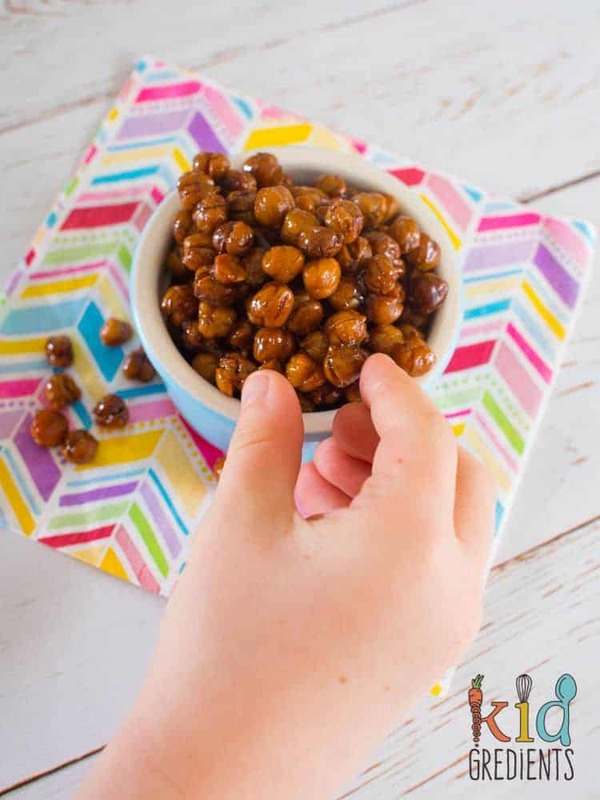 I know you can buy little packets of roasted chickpeas, but these are a fun weekend or afternoon cooking activity that you can do with your kids as they are simple to do. You don’t have to remove the skins, we do that just because my daughter finds it fun and powers through a whole can removing the skins in about 5 minutes. slightly sticky and so yum! What else is good about them? Well, they are good as a nut replacer as they are crunchy and yummy, and aren’t a nut! So that means kids can get the satisfaction of the crunch of nuts without putting their friends at risk at school. They are also fabulous if you use a yumbox as they fit in the treat hole! Which means no more struggles to find something delicious that is tiny enough to go in there! There are so many flavour options, I’m going to do a few more in the lead up to back to school- so that you’re fully chickpea equipped! Need more chickpea ideas? Or want to ditch the canned chickpeas? Then try these versions, roasted chickpeas…sweet and savoury. 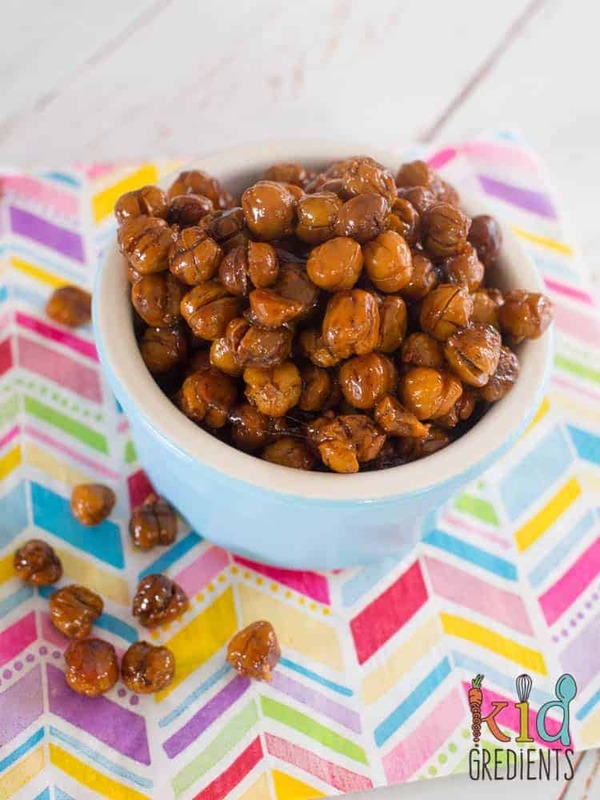 Maple vanilla roasted chickpeas, only 4 ingredients and perfect for the lunchbox! Preheat the oven to 180 degrees celsius/ 355F. Drain and rinse the tinned chickpeas and pour onto a lined baking tray. OPTIONAL- remove the skins from the chickpeas. Bake at 180 degrees celsius, 355F for 45 minutes or until crunchy. Combine the coconut oil, maple syrup and vanilla in a jug and mix well. Remove the chickpeas from the oven pour over the wet mixture. Quickly stir with a spatula to ensure they are all coated, then return to the oven for 10 minutes more. Remove from the oven and stir a bit more before leaving to cool. Yes, they should be crunchy right through! Pop them back in a little longer. Can you usr vanilla essence instead of paste and if so how much? Hi, how long will these keep for once made and stored in the fridge? They don’t last very long- mainly because they get gobbled straight away but about 5 days in the fridge!